Former Guantanamo prison official Ret. Col. Morris Davis has discussed with RT how the once 'temporary' facility has become a money pit as repair costs and yearly maintenance bills begin to pile up. 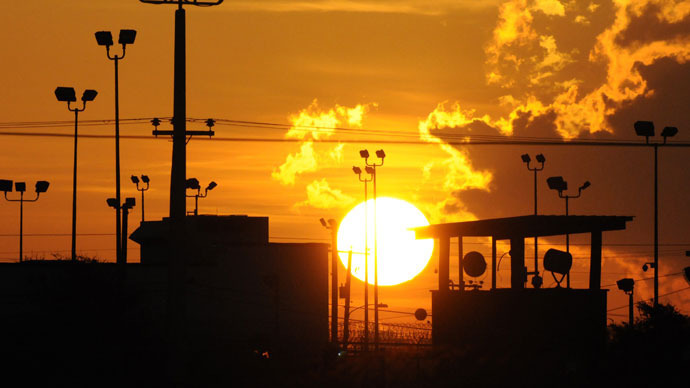 As prison officials at Guantanamo Bay, Cuba, struggle to explain an inmate hunger strike a new report has revealed that the United States Southern Command has requested funding for construction of a new building, as well as for maintenance on the existing facility. Media outlets have speculated that the new project could cost American taxpayers a sum approaching $200 million, a sum that had some scratching their heads after Southern Command General John F. Kelly testified before Congress Wednesday that the improvements would cost between $150 and $170 million. The existence of Camp 7, where some of the military’s most notorious inmates are housed, has long been known, but never commented on by top officials. A new detention structure to replace the dilapidated Camp 7 would cost the US government $49 million out of the $195.7 million price tag, according to the New York Times. “There’s other projects that I couldn’t talk about here in the open, but do have to do with replacing one of the camp facilities where some of the detainees are – special detainees are housed. We could get into that offline if you want,” he told the New York Times. Davis, former chief prosecutor of the Guantanamo military commissions, told RT how the detention center came to exceed the temporary nature of its construction, and why defense officials now find it necessary to request tens of millions of dollars in repairs. He also suggests that attorneys working with detainees suspect that the ongoing hunger strike could be several times larger than the Pentagon has thus far confirmed. RT:So, the general is now asking for $170 million to upgrade a prison that the president vowed to close. So is this a sign that Guantanamo Bay is not closing any time soon? Morris Davis: It certainly appears that way -- it was interesting General Kelly said Guantanamo was intended to be a temporary facility, so the things that were built were intended to last for a few years, not for a decade or more. We’re in our 11th year now, so it’s, what, another $150 to $170 million on top of the $120 million they spend every year just on the recurring costs of keeping the detainees there. RT:Right, so going along with what the general said, was the intention for this place to shut down but now we’re just in so deep that’s just not feasible? MD: Right, when I was involved as chief prosecutor we designed the expeditionary courtroom, which was a prefab type building because it was intended to be used for a couple of years and then disassembled and taken apart and never used again. But you know, that was back in 2006, 2007, and the clock keeps running, and the facilities just weren’t meant to last for 10 or 11 years. RT:I wanted to take a look at now at some of the things that General Kelly pointed out, as things he needs money for. One of them a new $12 million dining hall for the troops, $11 million hospital and medical units for detainees, and almost $11 million for a communications network facility to store data and computer records and things like that. So aside from the hospital, General Kelly says detainees, the conditions that they’re living in, that they are subjected to are just fine -- is that the case? MD: I haven’t been down there in a couple of years, but I believe that’s probably correct. Because their facilities were built modeled after prisons here in the US, so they were mainly just more permanent type structures. But as the general said, these guys are getting older -- they’ve been there 10 or 11 years, and some of them are beginning to get into that geriatric medical state that Gitmo wasn’t really equipped to handle. So it’s really interesting to me, you have the fiscal conservatives here that are trying to pass a budget with drastic cuts, but here we have Guantanamo, where they want to spend $120 million a year to keep, in essence, 80 guys that we really want to keep incarcerated and $150 million on top of that, so in a few years that adds up to a considerable amount of money. Now they’re talking about de-funding NPR, and I mean the NPR’s budget you could find for a couple of decades based on what we’re spending in Gitmo. RT:Right, and they’re asking for millions and millions of dollars on something that President Obama said was going to close long ago. You talked about the health concerns that they’re facing there, and many of them have been there for quite a while -- over a decade -- and now there’s this hunger strike which surely isn’t making their health conditions any better. The detainees say that they’re going on a hunger strike to protest that some of their personal belongings, Korans, were mishandled, but the general came out and said something different. He said that they’re actually angry at President Obama for not closing the prison like he said that they would. Is that the real reason? MD: I don’t know -- apparently they had hope and change in mind as well when President Obama took office, and I guess they’ve been just as disillusioned as a lot of us that bought into that slogan as well. But here you have a majority of the men at Guantanamo -- 86 of the 106 who have been cleared for transfer -- who have been in confinement now for more than a decade in some cases. So to them, with the hunger strike, they’re kind of out of sight out of mind and the only way to potentially call attention to it is to do something drastic like a hunger strike. So the numbers -- DoD has said the numbers have gone from seven to 14 to 21, to I believe 25 is the last official number. But if you talk to some of the attorneys that have been down there, they say that’s a low-ball figure, that it’s probably three or four times that. RT:Right, and now they are getting some attention -- what do you think it will take for this base to close down? MD: Well, I think it’s going to take the American people paying attention and demanding that it be closed. I mean if you look at the issue of drones, the program with drones went on for a number of years and not much really happened until people here suddenly paid attention -- it took Rand Paul doing a filibuster. It’s going to take the American public focusing their attention on Guantanamo, and unfortunately sometimes it takes people dying for that to happen. MD: And a waste of money, there’s a lot of money being wasted at Guantanamo, and a lot of our prestige is going down the tubes as well. So there’s just no good reason to keep it going.